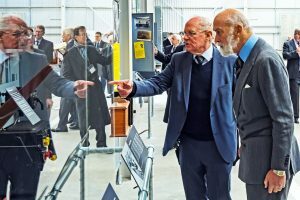 AN EXHIBITION telling the story of 80 years of aircraft manufacture and innovation at Brooklands has been opened by Prince Michael of Kent. The Brooklands Aircraft Factory is in the restored Bellman Hangar, which was taken down from its site over the Finishing Straight of the racetrack earlier this year and rebuilt in a new position in a £8.4 million project. The Vickers Wellington Bomber “R” for “‘Robert” that was rescued from Loch Ness and is the only one left that was flown in active service in the Second World War, is in the hangar along with other aircraft and their major components in various stages of completion on “assembly lines”. Next door is a new building, the Flight Shed, which is filled with completed aircraft from Sopwith Camel to Harrier with smaller exhibits concerning the pilots and navigators who flew the aircraft and the technological developments that helped them to do so. During the opening of the exhibition, the biplane was taken outside for taxying displays, giving off the strong, evocative, smell of castor oil.